Thomas Wilson Invasive Species Monitoring Project. GLSPS members gathered for the Thomas Wilson Invasive Species Monitoring Project on September 27th and 28th. For the seventh year of this project, divers Jack Decker, Randy Flacksbarth, Steve Daniel and Corey Daniel joined project leader Tim Pranke, and Captain Phil Kerber. Saturday morning the crew woke before sunrise to cast off for the cruise down the St Louis River. Jack cooked a tasty breakfast as we watched a wonderful sunrise over the big lake. A quick stop was made at the Garfield Ave boat launch to pick up local GLSPS Members, Steve and Corey Daniel. After the anchor was set on the shipwreck, Tim and Phil made a dive to re-check the anchor and place location markers in previously determined locations to count the mussel population areas. The visibility was a very poor, (about ten feet) but the Wilson always makes you work pretty hard to enjoy this special shipwreck. After the morning dives, lunch was served onboard the R/V Preservation followed by more diving. The team did excellent work, accomplishing all tasks planned for the day, with plenty of time left to explore the wreck. That evening, we were granted permission to dock the RV Preservation at the Barkers Inn Marina for an overnight stay. Phil and a few other GLSPS folks attended the wedding of Ryan and Kayla Staley. The GLSPS would like to thank Barkers’ Island Marina for the donation of a slip for Saturday evening. Sunday morning Jack Decker treated us with another spectacular hot breakfast on the way to Garfield Ave to pick up the local dive team again. At the wreck site the bow was slated to be surveyed, and picked up where we left off from the previous days schedule. Each team participated in two dives before it was time to head back. The GLSPS scheduled two weekends for this project. Mother Nature didn’t care for our plans to schedule a second weekend project. There were no promising forecasts in the near future and certainly not before it was time to haul out the boat for the season. While it was disappointing that all of the desired documentation wasn’t completed but, a lot of good data was collected. A good time was had by all. 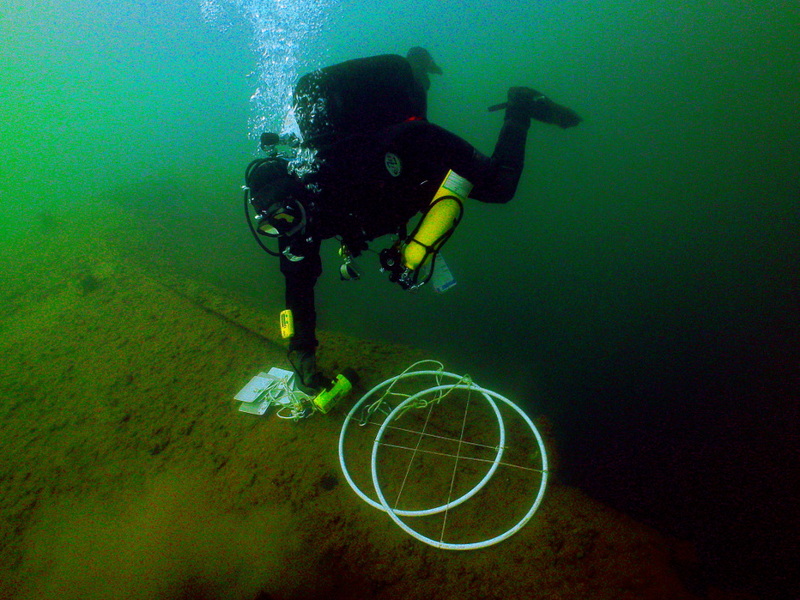 After seven years of documenting and collecting data on the Thomas Wilson shipwreck, the data indicated a 10% increase in muscle population since the first year of the project. It is also disturbing that there is a fast rate of the deterioration around the bow area and it is collapsing. To learn more and to see the data spread sheet we assembled of the muscle population, you can obtain it from the GLSPS website under the “Project Documents” tab. In addition, this fall at the Gales of November Conference in Duluth, contact was made with the University of Minnesota Duluth. They were very interested in hearing what data we collected on the invasive species in Lake Superior. The GLSPS will be applying for grant to provide funding in hopes to expand the project with the University of Minnesota Duluth and the possibility of stabilizing the bow. Keep your eye on the web page for details on the 2015 project as they come together next spring.